In the wake of Jonathan Ross’ documentary on Steve Ditko, which aired on BBC 4 last night and again today (no, I didn’t see it. A valiant effort at finding a set that provided access availed me nought, alas), a good deal of Ditko-related material has surfaced on the web. Go to the site and check out the video snippet with Stan Lee – it unfortunately leaves us hanging off the cliff, but is nevertheless gripping for the insight it offers into Lee’s understanding of the creation of Spider-Man. 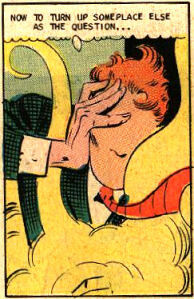 Mark Evanier takes exception to Ross’ obfuscation of the reasons for Ditko’s departure from Marvel in 1966, and also tempers the famous story of his and Lee’s disagreement over the identity of Spider-Man arch-villain the Green Goblin (mentioned in Morten Søndergård’s article on the early Spider-Man, published here recently), with some common sense. For more Ditko information, check out Blake Bell’s ‘Ditko Looked Up’ site.